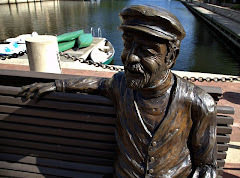 Restonian: News blog from Reston, Virginia, the mauve-colored New Town (tm): Happy 100th, Mr. Simon! Today is Bob Simon's 100th birthday. From Carnegie Hall to a high-rise he built at around the time of his 50th birthday on the shores of a lake that he also built, it's been quite a century for Reston's founder. Let's celebrate by taking a walk around Lake Anne and raising a martini, as Simon still does every day -- at least when he's not busy playing the congas, dog sledding in Canada or visiting India, to name a few of the things things he's done in just the last few years. As impressive as his accomplishments have been in urban planning and remaining a civic leader for nearly an unbroken half-century, he's also become a legitimate role model for aging in place -- and aging well. We can only hope we're in as good shape when we're half his age, even if we can't quite celebrate our 50th trip around the sun by building a planned community of our own. So raise a glass to Mr. Simon. And let's also thank him again for not building his New Town on Staten Island or calling it Simon City. Happy B'day, Mr. Simon. May the next hundred be as good to you as the first hundred.